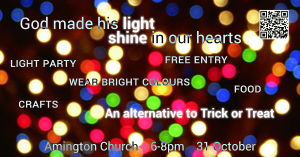 At St Editha’s Amington this year we are having a party on Halloween, to celebrate the light that God brings to the world. It starts at 6pm, and will finish by 8pm. It’s completely free (donations are always welcome but not required) – there’s no need to book in but if you could let us know you’re coming via our Facebook page, that would be a great help. Eat something before you arrive – if you want something more than a hotdog, sweets and crisps!